How many times have we dreamed of saying those words and practicing the speech you are going to make to your employer for days? Regardless of whether you were happy or not, the event will fill you with apprehension. Am I letting them down? They have been good to me, or perhaps, you are establishing what words you can and cannot say at that last meeting that won’t be too inappropriate. Regardless the event leading up to it is very stressful for the person resigning for two reasons. Firstly you know that it is going to be a big change in your life and you are worried about what they are going to say, because whilst you have been pondering and practicing for days, when the words come out of your mouth, chances are, they are going to be a little surprised, to say the least! I recall many years ago I was working on my planned resignation speech and had to re-write it many times. Knowing that if I said, what I wanted to say, there could be repercussions. Chances are you are in a specialist industry, which I was and I knew that if I said, what I wanted to say, and word got out that I did that, it may affect my chances of getting employed in the future, which ultimately means that we leave never telling them what we actually thought. Exit Interviews have been around for a century but we are never honest. Sometimes we may say something dreadful like “they didn’t provide much if any feedback on my performance” when you want to say, they had the communication level of a pineapple! Inevitably the person who actually does the Exit Interview is the person who was happy in their role and wants to ensure that their boss gets a final, thank you. For the Employer at the utterance of those “I am very sorry to tell you, but I have obtained another opportunity and I will be providing my 2 weeks notice, happy to work them if you require me to do so?” Their world has just changed, whether you are the star performer or not, they now have a hole that right at this point in time looks around the size of the Black Hole. Whilst you are still trying to placate the situation, they are thinking through their alternatives, who, what where, and most important of all, what will this cost me? Pretty much any conversation you have with them is not going to be heard. They will be in high gear trying to work out the best case scenario for their business. Many years ago, I left a boss and put my best friend into the role. She was supposed to just stay until he found someone else, but she remained in the role for a few years. Perfect scenario that happens very rarely I am afraid. Whilst we are here, we should probably briefly talk about Constructive Termination. Most people have heard of it, but probably don’t really know what that means. The crux of this is that the relationship has broken down irretrievably and the Employee has no choice but to resign. They feel that they cannot continue to work with their Employer. 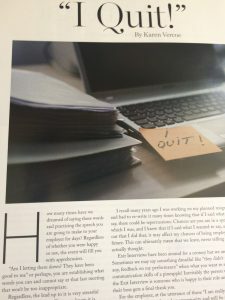 Generally what happens is the Employer may do things like, ask for their resignation to allow them the opportunity to locate another job without the stigma of a termination. They may provide an unsafe workplace, they may demote them, or decrease their salary, or act in a way that makes it impossible for the person to do their role, i.e. ignoring them. The Employee resigns and now they decide to take the matter to the Fair Work Commission for a decision as to whether their resignation was of their choice. Sometimes an Employer may be “managing” the person and be a bit over zealous in their approach creating an environment where the Employee feels that they cannot work comfortably. I guess the upside of a Constructive Termination case is that the Employee who resigned has to prove that you acted incorrectly. So, the best course of action is to ensure that you don’t act inappropriately to warrant this type of claim. I always recommend to our clients that a degree of control should always be exercised and if you feel inclined to yell or be abusive in any way, you should extract yourself from the discussion, because if your staff witness you “losing it” on regular occasions, it would not be difficult for that person to prove a Constructive Termination case against you. So, clearly the resignation process is always a difficult one for both parties. Our best advice is whether you are the Employer or the Employee, go into the meeting trying to keep in mind their point of view. How this will affect them? You want to be the Employer that people say, “I resigned because of a great opportunity, but it was certainly the best place I ever worked”. Good luck with the process, ensure you go into it thinking that the next opportunity will be the one that made your career or business what it is today.